Setrakian and Eicchorst attempt to outbid one another for possession of the Lumen on The Strain Season 2 Episode 13. Elsewhere, Eph, Nora, and Zack's trip is cut short by a calculated attack. 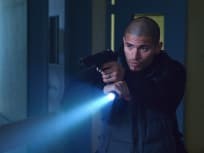 Eph has a difficult choice to make, while Gus and Angel put together their gang of Sun-hunters on The Strain Season 2 Episode 12. Dutch struggles to survive as Eichhorst's captive on The Strain Season 2 Episode 11. Elsewhere, Setrakian comes face to face with the man that knocked him out. 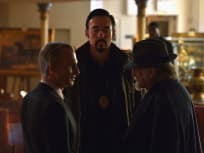 Eph and Dutch work together to bring down Palmer on The Strain Season 2 Episode 10. Elsewhere, Setrakian searches for Rudyard Fonescu; the Lumen's true owner. 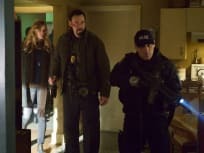 Justine and her troops defend Red Hook from a surprise attack on The Strain Season 2 Episode 9. Setrakian faces off against an old and dangerous adversary. Fet and Setrakian make a play for the Lumen on The Strain Season 2 Episode 8. Meanwhile, Kelly makes a move of her own and this time using the face Zack recognizes. 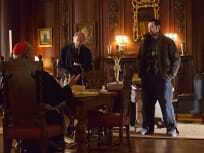 Setrakian and Fet encounter a mysterious new player while hunting the Master on The Strain Season 2 Episode 7. Elsewhere, Eph returns shifting his focus to Eldritch Palmer. Eph shares his plan for mass dispersal of the bioweapon on The Strain Season 2 Episode 6. Elsewhere, Kelly and the Feelers catch Zack's scent and attack. 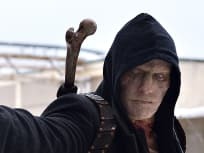 Eph takes on a new look to sneak out of the city on The Strain Season 2 Episode 5. Meanwhile, Dutch and Nora meet Councilwoman Feraldo in the hopes of springing Fet from jail. Eph and Nora test their strigoi killer in the wild on The Strain Season 2 Episode 4. Elsewhere, Setrakian and Dutch seek out Palmer’s former bodyguard, Mr. Fitzwilliam.